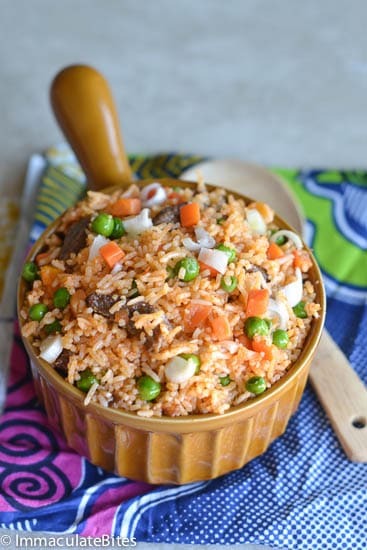 Jollof Rice (Jellof Rice) – a popular Nigerian one-pot dish that is bursting with flavors topped with mixed veggies and wide variety or protein for an incredible easy and hearty meal in a bowl! 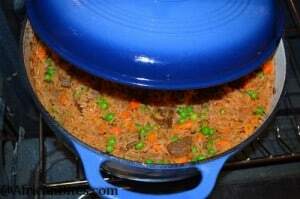 Jollof rice is a legendary one-pot dish that’s ubiquitous in Nigeria and popular elsewhere in West Africa. It is a fairly easy dish to make anywhere in the world because the ingredients are easy to find. As with most African food each country, region and even households have put their own imprint on the recipe- from mixed vegetables to various choice of meat/ chicken or even a vegetarian style. 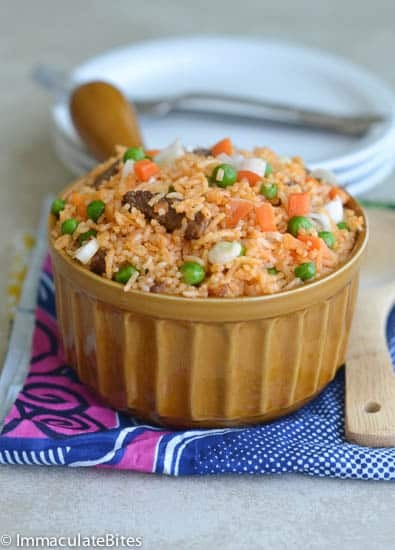 Jollof rice has a tendency of sticking to the pot and producing a burnt taste .There has been fierce dispute about what makes, Jellof rice unique some say it is the burnt taste others fiercely disagree- it just the combination of ingredients which makes for a great tasting meal. I prefer making jollof rice partly on the stove, then finishing it in the oven, although it takes a bit longer to cook, I find the even heat turns out a better product and minimizes the burnt taste. 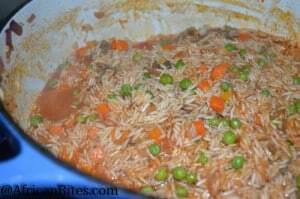 This is the basic recipe which consists of: rice, onions, tomatoes, pepper and meat. 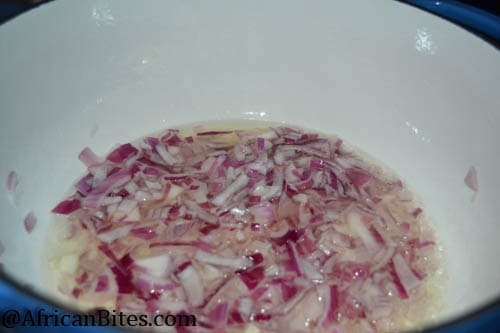 Onions is fried until translucent (2-3 minutes). 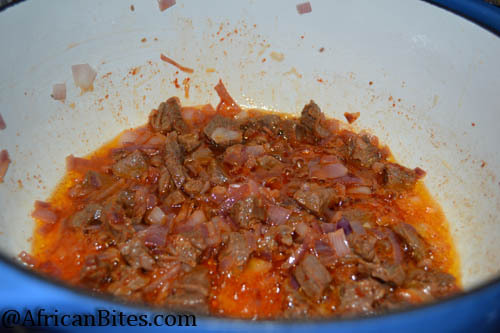 Then tomatoe sauce and paste is slowly added to the onions. To reduce the acidity or sour taste of the tomato sauce it is simmered for 10 -15 minutes followed by the addition of rice. While the rice is cooking over medium heat stock is added careful little at a time to be absorbed by the rice to produce very tasty and fluffy Jellof rice. Don’t let this simple, quick and straightforward versions of the classic Jellof rice fool you — it has tons of flavors. This dish becomes even more flavorful after it sits for a while, and it’s delicious at room temperature. 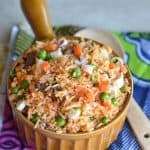 Jollof Rice (Jellof Rice) - a popular Nigerian one-pot dish that is bursting with flavors topped with mixed veggies and wide variety or protein for an incredible easy and hearty meal in a bowl! 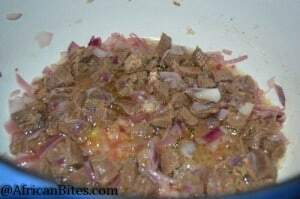 Boil meat with salt, pepper and some chopped onions in a medium pot until tender. It will take approximately 30 to 40 minutes depending on the meat (chuck, round, shank). I used the chuck for this recipe so I had to boil it for about 35 minutes. Reserve the stock for later use. Add oil to the Dutch oven or oven safe pot/pan and fry the onions until soft but not golden, about 5 minutes. Include some bouillon. Then, add the meat and continue frying the onions and meat for 3 minutes. Next add tomato paste and sauce. Stir the pot frequently to prevent the sauce from sticking to the pot. 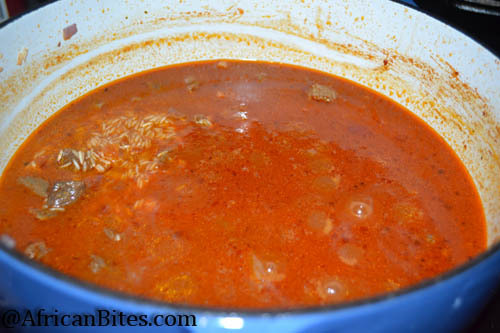 Add salt, paprika and bouillon according to preference with about 2 cups of stock. 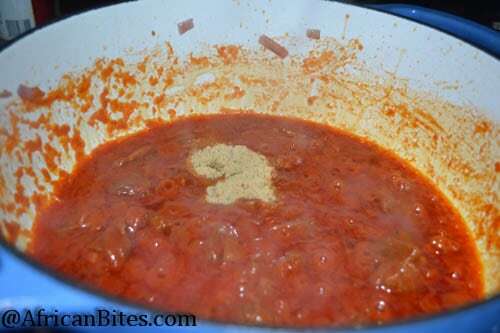 Bring to a boil and let it simmer to blend all the flavors and reduce acidity of the tomato sauce. Approximately 20 minutes. Stir occasionally. Put the rice into a large bowl, cover with cold water and use your hands to wash the grains. Tip the water out then repeat twice until the water runs clear. 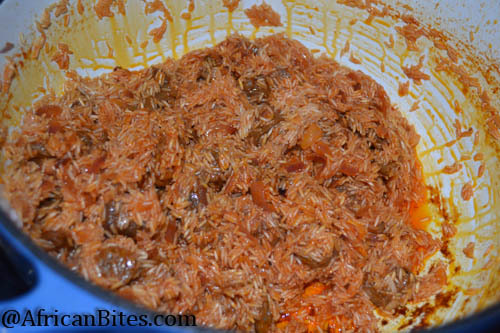 Add the rice to the pan with some stock/water -1 cup. Let it simmer for 5 minutes with lid on. Place the pot of rice in the oven. Add remaining peas and carrots. let it bake for about 10-15 minutes until tender. I made this without the meat. Still a big success. We loved this dish and my son who is quite picky couldn’t get enough. YUM!!! I am cooking it now . Had to use foil container. I covered it tightly and added more water/broth. It is still not fully cooked, even after 15 minutes in the oven. Any suggestions? Everyone I cook the rice it comes out crunchy. I don’t understand what’s happening. Make sure you use enough liquid,and tightly cover. Not really, it all depends on the individual, and spices used- more canned tomatoes and tomato paste would gives it that rich color. I love your recipes but the Jollof is not quite right. 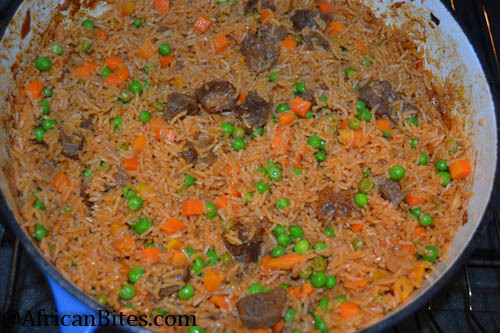 The addition of peas and carrots is not Ghanaian either I am afraid but as I say I love everything else! She didn’t say this was a Ghanaian jollof rice. I am Liberian and we have mixed veggies in ours. So yes I think it does depends on who is making it and what they put in it. I haven’t tried the recipe but it looks similar to how I make mine. 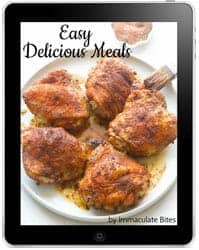 I found your site looking for fufu recipes and have loved it. There are so many things I want to try. Thank you for sharing! Thanks Edith! Glad someone else sees it the way I do. I have a feeling this is my new fave food site !!! My hubby is Ghanian and very picky. I hope he loves this rice as much as I do. 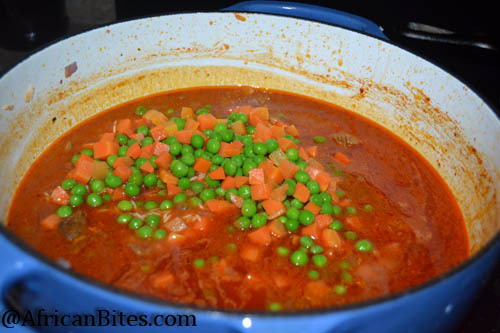 Thanks for this delicious easy recipe for a dish that can be very finicky. I will be sharing your site with my cooking buddies. My next food to try is Puff Puff! Thanks again! Hi Angelia! Thanks for sharing the site – really appreciate it! I know hubby it going to love this as much as you do. In ingredient list you have can of tomatoes, but in the instructions you have tomatoe sauce. Dace, it is canned tomato sauce. I am pretty stoked about this right now. 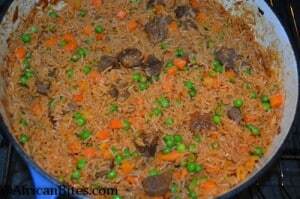 I had jollof rice in Ghana a few years ago and loved it. I have been dying to find a good recipe! Can’t wait to try this!! Victoria, you are going to love this recipe. 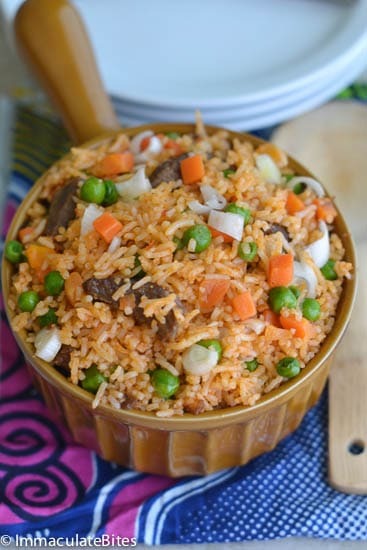 There is an even easier version of jollof rice this one here.https://africanbites.com/?p=7386. Let me know how it works for you! I also started making moi moi every Sunday. And my picky eaters love it. Let’s not even talk about the plantain porridge I made last night with dried fish and vegetables. Your presentations are inspiring. Thanks Ces is always good to get warm feedback! So I’m typing with my left hand while eating the best jollof rice ever. Thank you so much. I’ve sent a link to everyone I know who loves cooking and eating. This came out perfect! Now am going to try the oven jollof rice and see which one I like best! Do tell Amalia. Thanks for the feedback! Could this recipe be modified or changed as to be cooked entirely in an oven? If so what would the cooking time be? 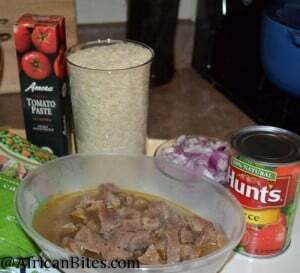 Tony, I have never tried cooking jellof rice entirely in the oven because you need to cook the tomatoes sauce first.What you can do is cook the sauce on stove and then cook the rest of the recipe in the the oven, with the required amount of water . It would take approximately 50-60 minutes or more in a covered dutch oven. Can i bake the rice in a foil pan because I do not have a safe oven pot. Again, is the rice going to be moist after baking because I don’t want it to be too dry. Yes you can bake it in a foil pan, however, make sure it is covered tightly.Be sure to include enough water/stock when placing the rice in the oven.